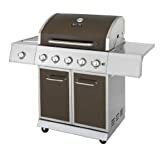 If you are looking for the best propane grills for the money, we can at least show you some of the best that are available to buy. When the sun is shining and it’s time to eat, a lot of people love cranking up the grill and putting on some steaks. To do this, you want to make sure that you have the right grill to do it with and there could be nothing easier than operating a propane grill. There are plenty of choices that you can choose from but one of the most important things to take into account is your budget. Based on how much you are willing to spend will dictate the kind of grill that you will get. With that being said, we have searched out the best top rated grills that your money can buy. So check out a few selections below. They will at the very least give you an ideal of some top units. When you talk about a grill that is convenient, efficient and versatile, then you are talking about the Coleman 2000017442 Propane Portable Grill. You can grill in your backyard on your patio or deck or you can take this one on the road. It features ignition for push button start with PerfectFlow Technology for a consistent performance. This unit has a collapsible stand along with wheels folds so that it can easily be transported. With this unit, you can set it up in seconds and grill your heart out. With the Dyna-Glo DGB390SNP-D Gas Grill, there is no question that this unit takes grilling to another level. This can be a great addition to your deck or patio. It features quick start up and heavy gauge porcelain enameled cast iron cooking grates along with stainless steel commercial grade burners. There is also a double wall stainless steel lid that retains heat. 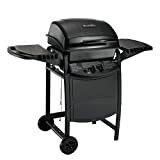 If you are looking to do some serious grilling and you need a lot of space, then the Char-Broil K6B 6 Burner Propane Gas Grill is the unit that just might fit your situation. It features 65,000 BTU’s on the main cooking space with 10,000 BTU’s of heat on the secondary side burner. It has 650 square inches of cooking surface with another 250 square inches on the swing away warming rack. The Weber Genesis 6511001 E-310 Propane Gas Grill is known for cooking some great food. You can enjoy this model on your deck or patio with friends, family or both. It features 38,000 BTU’s of heat on the main area which has 637 square inches of cooking space. There is front mounted control panel with 3 stainless steel burners and cast iron cooking grates and 5 year limited warranty.